You’ve heard of Batman right? No superpowers, just an awesome set of tools. Here is a small list of things I know will make you a goal setting monster. Setting a goal and achieving it with ease requires a concrete plan. Of that, there is no doubt. But for years I wasted so much time on blank 8 x 11 sheets in my own notebook when brilliant people are creating their own templates and just handing them out. How did I not know about this?! A goal setting planner is a guide that has you fill in all the necessary information, go through certain exercises and thought processes such that you easily cover all your bases and come out on top. It makes everything so much easier, and you don’t have to worry about leaving anything out or forgetting something. Follow these easy steps to ensure your goal setting success. Not in a wishy-washy way. But maintain believe that the process works, and it will work for you as well if you follow the rules. Create the roadmap in your mind, and keep it there for several minutes each day. Knowing what your success looks like is a tool you can use to get their faster and easier, with less detours along the way. Have you ever heard of a mission statement? Normally, companies and organizations will have a statement that their group stands by. It represents the company vision, morals, and overall reason for existing in the first place. It’s a “This is what we are about, and what we’re here to do” statement. When you do, you will know exactly what to say yes, and what to say no to as you journey toward the results you desire. It’s well known that groups, and individuals without a clear understanding of their purpose, end up wasting time, energy and just run themselves in circles. Writing your goals down and making an effort to recording them is the easiest way to make them “real”. When everything is on paper it’s easy to feel like you’re on the path to something great. Post-it notes on the wall with your goal written on them results plastered on excel sheets and inside journals are all wonderful way to take what’s in your mind and see it take shape. Not half goals, half-assed, or half anything. Nobody wants a half, they want the whole. If you’re not in it 100% nobody will care. Seriously focused. Even dangerously focused. When the CEO of Amazon was a little boy in school, they had to physically move him around the room when it was time to change activities because he was so focused. Focused like a magnifying glass harnessing the sun’s rays to burn a hole in a leaf. What am I/are we doing? Where are we doing it at? When will I do it? What time of day? How long will it take? Include a time frame, milestones along the way, and individual steps to make sure you stay on track. Make sure you get it done, and no excuses. You are accountable to yourself primarily. Find clever ways to keep yourself accountable by eliminating opportunities to give in, and making sure you’re in circumstances that will fuel your success. If you’re trying to cut out junk food, don’t bring it home with you. If you’re trying to lose weight or work out more, use the small gym at work before you come home and get in your pyjamas. Use common sense, and remember that your choices get you your results. Make good choices, get good results. Easy. And I mean literally as you read this. You can start by reading this article on procrastination, which will help you beat the urge to snooze on your goals. But seriously, when you have a brilliant idea or a goal in mind that you would like to achieve in the future, find something easy and small you can do to set yourself on that course right now. It could be as simple as doing some research on the topic for five minutes. We know the goal setting formula works, but there may be times when you need to adapt and adjust to make it work for your specific situation. When you don’t get the results you want, the best thing you can do first is to sit and think about how you can change things up. Too many times, we fail once and give up because we think it will never work. But almost nothing works the first time. What are the odds, honestly? Everything is a combination of variables, and with the right formula, and the fortitude to stick it out, you can push through and create a seriously awesome and empowered life. Results don’t come overnight. Sometimes the world needs a bit of time to catch up with the new you who’s getting after it. So understand what effort brings the results you want, then put forth that effort consistently while understanding when you should see results. People who set, and achieve meaningful goals that enrich their lives are often dreamers. Not wishy-washy hippies, but people who like to test the limits of their own potential. They enjoy thinking that “the possibilities are endless” and, even if that’s not entirely true, they certainly get after their goals thinking that there’s no force on earth that could stop them. High octane goal crushing machines are not just hulk like achievers with no soft side. Buried deep is a serious appreciation for all life has to offer. Even you reading this now have so much to be appreciative of. If not the results you don’t have yet, then the information that it’s possible in the first place. Everybody does the best with the resources they have. One of the greatest resources is knowledge on how to improve our lives. Many confused the world humility with representing the qualities of weak, meak, and no backbone types. A saint in the early 1900s described humility in the most beautiful way I’ve ever found. Knowing one’s actual position means understanding yourself on a deep level. You want to know your strengths, otherwise, how will you know what weapons to choose? You want to know your weaknesses, otherwise, where will you put your armor? You need to understand and be honest about what you know and what you don’t know. Not necessarily in some deity, but in the process of achievement itself. When we set out to achieve goals of any kind, doubt will inevitably creep into our experience on some level. When that happens, our faith in the process will keep us going. Many have come before you who’ve done it, and millions will come after you. Success and achievement are not awarded to people who are special, they are given to those who follow the rules. When you are goal setting, remember, there is nothing special about you that makes you fail, there is only you not combining the right ingredients to bake a decent success cake. Ever heard of the shotgun method? Starting a bunch of things and never committing to any of them. If you figure out something to set a goal for, that is deeply rewarding to you, and are willing to go after it, then there is no reason you shouldn’t commit to it wholeheartedly. Ever notice you get cranky when you’ve been without food? Your body requires a certain amount of resources to function and when you’re low on them (at the end of the day) it’s much easier to falter. As much as possible, try to do your important goal related tasks in the morning when you can fight off procrastination etc…easier. Everything in your life takes up space. If not literally, then energetically. Think of yourself as having space, and then identify what space in your life your goal occupies. Whatever is currently in it’s space will need to be removed and replaced. Like eating junk food being replaced with eating healthy. It’s not enough to avoid all the bad stuff. It’s better to have some weapons in your arsenal as well. Make a list of things that will ensure your success: like joining a support group, or a gym. Do they believe you can achieve what you desire? Do they have big desires of their own? Are they constantly trying to talk you out of it or convince you that you’re wasting your time? These are all things to ask yourself when deciding whether or not your environment is conducive for success. Most things are hard in the beginning. Walking, running, riding a bicycle, spelling basic words, are all things we struggled with first, but are easy for us now. When you first started to drive, there were a million things to think about. Now you just sit in the car and drive. An object at rest tends to stay at rest unless acted upon by an unequal and opposite force. This is true with matter, and also true with you and your goals. When we set our goals, we have a habit of doing something else, other than the goal. So the first part when our behaviour changes can be challenging. You just need to push through enough to when it starts to get easier. It always happens this way. Your goal is your result. Your result is your destination. For a destination, you need a map to follow along the way. And for a roadmap, you require a starting point and other important details. Do you see now why being clear and concise about your goals is essential? 2. Without clarity of purpose, you will waste time and energy on things that are irrelevant to you. Being clear during your goal setting and achieving process allows you to allocate your energy only to what matters. Otherwise, you’ll be running around to everything shiny thing that comes up. Does anyone gain muscle working out “every once in a while”? People who are successful achievers understand this simple idea. Success is a formula. Failure is nothing but the absence of the “Y” part of the equation. Adaptation means you are willing to understand, that when “Z” is not what you want, you just need to tweak the “Y” until it works. Are you doing this with the right people? Who else is required? Who should you get advice from? Are you prepared for this? Are you doing the right activity even? Do you have a solid plan of action? What are you doing that could be better? What are you doing that’s wrong altogether? Are you doing this for the right reasons? How intrinsic are the results you get? Are they just superficial? Are you in the right environment for this? Surrounded by the right kind of support? Are you getting your information from the right place? Are you doing this at the right time of day? Are you in the right season of life to achieve this goal? Is this an expansive time in your life or a refinement time in your life? How long should this be taking you? How long does it take others? Goals need to be heart-centred or they’ll just burn you out. Don’t set goals just to “keep up with the jones’s”. Your goals need to be intrinsically and extrinsically rewarding for you to stick with them in the long-term. You need to be thoroughly honest with yourself. Don’t tell yourself nonsense like “Well, I did my best” when you know you took it easy on yourself. Goals required dedication. And to be dedicated you need to be honest about the effort you’re putting forth. Who doesn’t love a good challenge? Your brain, that’s who. But in order to achieve anything in life, you’ll have to be smart enough to work around or through your brain’s desire for an easy life. When something feels stressful in your mind, your brain is gonna try and keep you from doing that thing. You can either scream like a saiyan and push through it, or try one of the many brain hacks available for ending procrastination completely. Stack the odds in your favour and stockpile as much information on your goal as possible. Who will be involved in reaching my goal? Only me? Or others as well? Who has done this before me? How long did it take them? How long do I think I could do it in? How will the results change how I see myself? How will others see me when I win this goal setting game? Is this goal comprehensive? Does it accomplish several things for me at once? How much am I willing to sweat and bleed for this goal? Will I quit when it gets tough? What kind of grit is required to accomplish this? Goals are the simple part of the machine that nobody cares about. Goals are what take our current ceiling and make it our future floor. Humans, by nature, are experiencers. Not only this but we as the experiencer desire to experience more, every day and all day. Factually, we consume experiences more so than food even. To get more, or to starve. Those who choose to starve, pretend like staying the same is satisfying. But when a person chooses to get more, they level life’s obstacles, speed passed their competition and so habitually, making them appear superhuman. They weren’t bitten by something radioactive: they have a system! How Many Types of Goals Are There? So, why does it seem like those who are rich in goals are only getting richer and those who are poor in goals get trampled on? All they did was start to embody more and more of what “someone who achieves their goals” is. You see, life is about “give and take”. So if you want life to give you the results you desire, you need to be OK with giving life what it wants in return. Someone who will use the gift well. Think of life as a person. Would you give anything at all, to a person who wasn’t willing to work for it, didn’t appreciate it and would just waste it after you left? We have come to the end of 5 segments on discovering you, you goals, your passions. Now what ? Now, you take whatever you have read, and can use, and start the journey. Start today. If you have done the reading, then there is no barrier to stop you. Just be patient and do one small step at a time. “Small successes drives motivation.” Let your small successes be your inspiration to continue your journey. May your journey’s end find you fulfilled. Best of luck to you. This last article is perhaps the longest, (but is has lot’s of pictures), and some questions to answer as you read. Very thought provoking. Enjoy. You need to identify what’s at stake. I often reflect on how blessed I am to work the way I’ve always wanted to — independently, and why I do what I do as a creative entrepreneur. I confess, I think about the why a lot. Notice I said think instead of wonder why. I’ve moved way past the question, “Why am I doing this?” I know why, and rather than trying to figure that out, I simply need to remind myself of it! When we feel validated in what we’re doing: a client praises our work, a project turns out successfully, a good client recommends use to another, we see the good results of what we’re doing. In those cases, the Why appears obvious. It’s in the other times – we lose a client, we don’t see hoped-for results, we’re given a poor evaluation, we’re just not having fun – that knowing Why becomes vital. In spite of setbacks, we need to return to that in order to keep going. Your Why is that deep-down, personal motivation for what you do. The thing I’ve learned and will pass on to you is this: Until you identify your Whys, you won’t be able to get clear about your Whats and Hows. For example, my Whys include freedom. Freedom is one of my primary motivators, both professionally and personally. Freedom – the ability to do the work I want to do and choose who I work with, to set my own schedules, to go where I want to when I want to, to integrate and balance work and family life — is a big reason I chose to be self-employed. I was a salaried employee several times during my school years, but it just didn’t fit. There were times since launching my freelance business when I seriously considered returning to a salaried position, but I kept coming back to the freedom issue. That Why, among others, has kept me moving forward and on track. about your Whats and Hows. Why is finding your Why important? If you don’t discover your Why, your chances of success are slim. Any worthy goal will meet with resistance. If you have lofty goals for your life (hopefully you do), you will go against the tide along the way. You’ll experience engine trouble, flat tires, detours and traffic jams (using the Road Trip vernacular). You might even crash. The only motivator you will have for pushing through the roadblocks is your Why. What is that destination you need to get to? Why does it matter? What is at stake – for you and those connected to you – if you do not accomplish your goals? Many who set solid, realistic goals don’t achieve them. Why? They are not motivated by their Why. The secret of the Why is that it is personal to you. It’s not about being helpful to others, although that should be a result. Your Why is all about what’s in it for you. If you don’t have a stake in it, it’s not your Why. 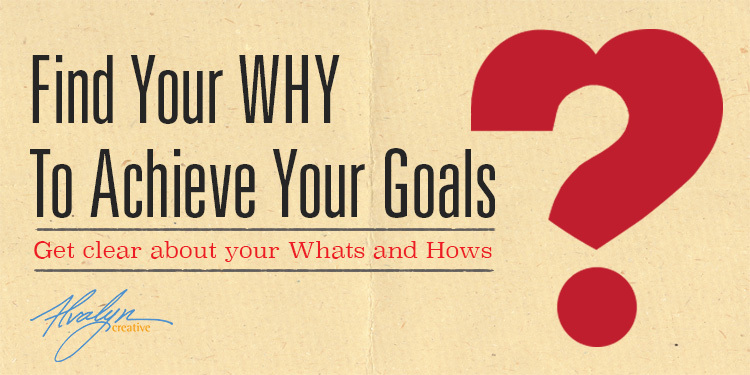 For each of your goals and destinations, there exists a Why. You don’t need to fabricate it because it already exists. You simply need to discover it. Set aside the better part of an hour in the next week to do the following. Be sure you’re writing, doodling or drawing in some form and not just thinking. Over the next 12 months, I will read 12 books about business and marketing. I will send one marketing email per month to 25 prospective clients for the next 12 months. In the next 60 days, I will invite 5 entrepreneurs to join me for coffee so that I can pick their brains. Be sure you make your goals relevant to you. Goal: In the next 60 days, I will invite 5 entrepreneurs to join me for coffee so that I can pick their brains. – Because I need to get to know people who have successful businesses because I want to learn how to build a successful business so that I can quit my job. – Because I need to make professional connections who will be good resources for new business referrals, because I want to expand my client base and get better clients so that I don’t have to chase payments. – Because I want to brainstorm my ideas with people I trust who are not in my field, because I don’t know on my own if there’s a market for my ideas, and I want my ideas to create success for me because I need to earn money to pay down my student loan debt. If you cannot think of at least 3 personal motivations for each of your specific goals, carefully consider if it is indeed the right goal. Your reasons should be both emotionally and intellectually compelling. You can do this exercise for any goal, personal or business. 3. Prioritize the motivations from most to least important. Now, put your list in an easily accessible place so that you can review it weekly. That’s it. It’s pretty simple. There is much at stake if you don’t plan your steps and set your goals. You will not take those steps without being motivated to do so. As you take those steps, you will experience resistance. Remembering your motivations – your Whys – will propel you forward in spite of opposition. Alvalyn Lundgren is the founder and design director at Alvalyn Creative, an independent practice near Thousand Oaks, California. She creates visual branding, publications and books for business, entrepreneurs and authors. She is the creator of Freelance Road Trip — a business roadmap program for creative freelancers. Contact her for your visual branding, graphic and digital design needs. Join her on Twitter, Facebook, Instagram, and subscribe to her free monthly newsletter.